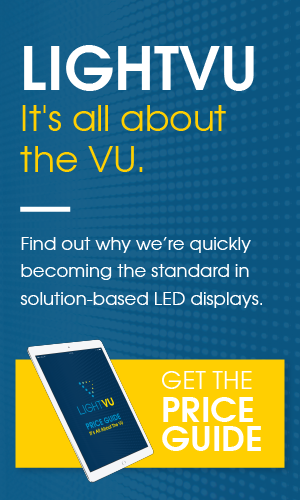 LIGHTVU, Canada’s most forward-thinking LED display manufacturing company, has a unique way of showcasing their products. Rather than scheduling a time for their potential clients to come and view a screen by taking them to a previously designed and installed screen, they’ve created a jaw-dropping showroom that displays their most innovative screens. Walking into the room is a wall-to-wall assault to the senses, showcasing their many state-of-the-art LED displays. From the Aurora, which is great for short-viewing distances, to the Jupiter, which is created for outdoor signs, this showroom has it all. LIGHTVU will be hosting an official launch in the fall but has since hosted a few soft-openings and parties. When hosting several car dealerships, Light VU was able to highlight their Crystal Curtain series, which allows for bright product signage to be displayed in a window, without blocking the natural light from coming in. Perfect for all businesses with large glass walls. The space is great for meet and greets, evening parties, cocktails with hor d’eouvres events and birthday parties. With a built-in bar, LIGHTVU has equipped the room for the best parties. They hope to convince the end-user that their screens are the finest in the industry. Seeing all their screens in one place allows for LIGHTVU to truly highlight the benefit and usability of the technology. The vision for the showroom was Mark Silvius’s, principal of LIGHTVU. With an official grand opening imminent, LIGHTVU is hoping to be able to wow potential clients with this innovative and jaw-dropping showroom. Stay tuned for information on the grand opening!